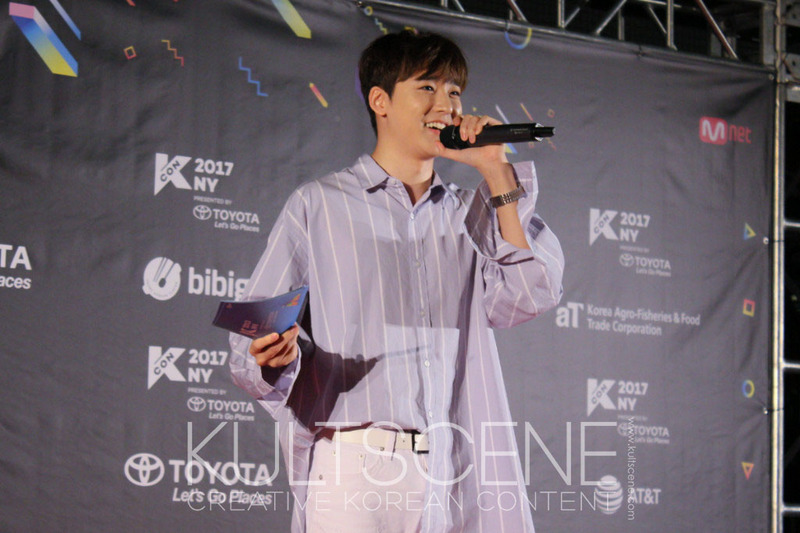 With every passing year KCON 2017 NY presented by Toyota outdoes itself, and this time around was no different. This year was the first where the convention was paid, and while lots of fans expressed their annoyance before the event, once June 23 and 24 rolled out, it all made sense. 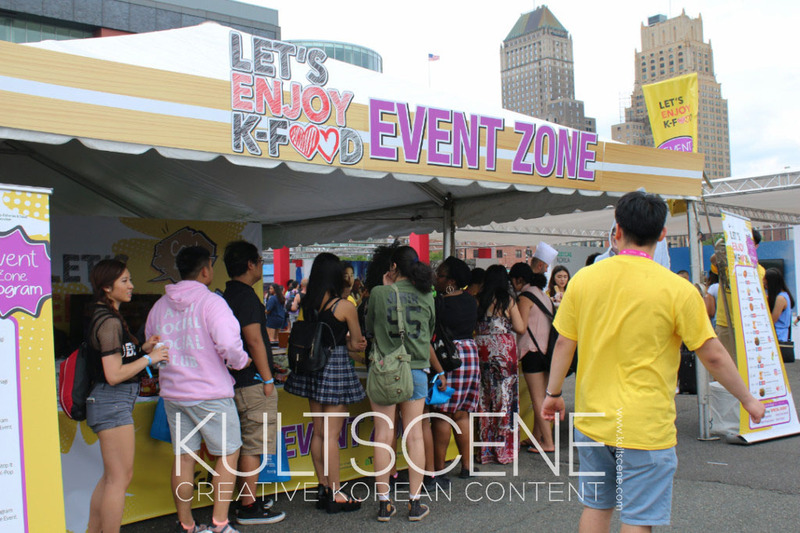 Held once again outside of Newark, NJ’s Prudential Center, the con of this year’s KCON NY was larger in size, expositors, and talent than previous years. In previous installments, a common complaint was that there wasn’t much to do at the convention if you didn’t have fan engagements with the artists to go to. That changed this year. Panels were more varied topically, a gaming competition was held, sponsors and exhibitors conducted lots of fun giveaway contests, more artists performed on the outdoor stage, and lots of popular YouTubers roamed the grounds taking pictures with subscribers and fans. 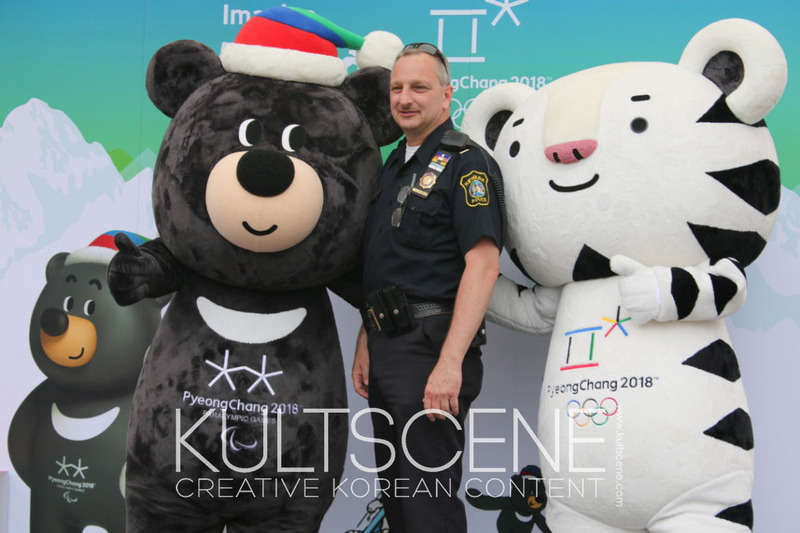 And in anticipation of the PyeongChang 2018 Olympic Games, KCON brought lifesize versions of Soohorang, the white tiger mascot of the main Games, and Bandabi, the Asiatic Black Bear representative of the PyeongChang Paraolympics, for conventions goers to interact with throughout the two-day event. 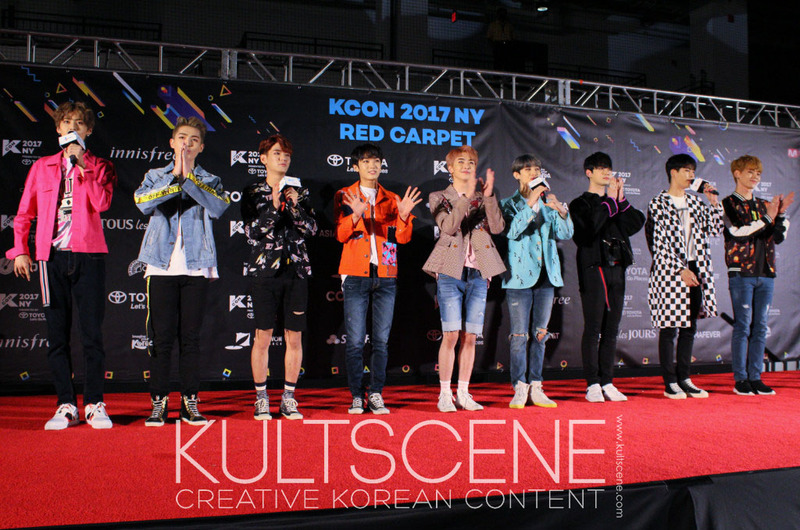 2017 was, indeed, the year of “more” at KCON NY. 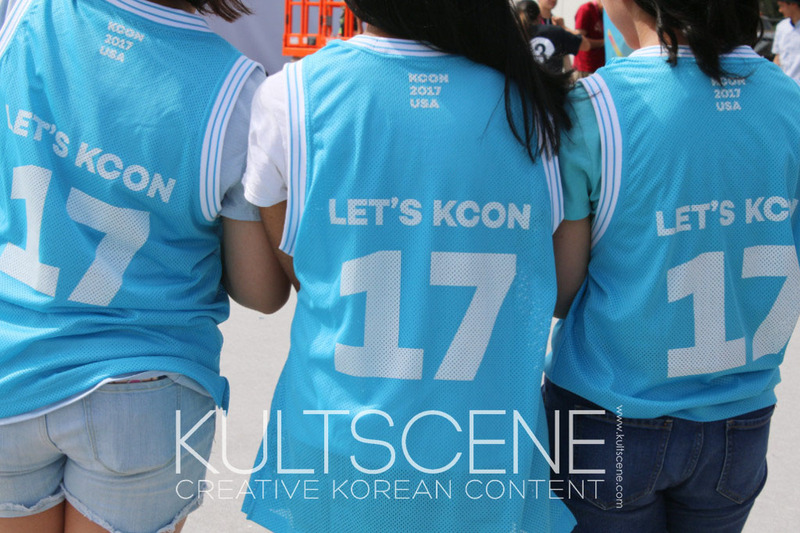 Always trailing behind the Los Angeles installment, KCON 2017 NY this year proved that it means business and that it’s only growing. 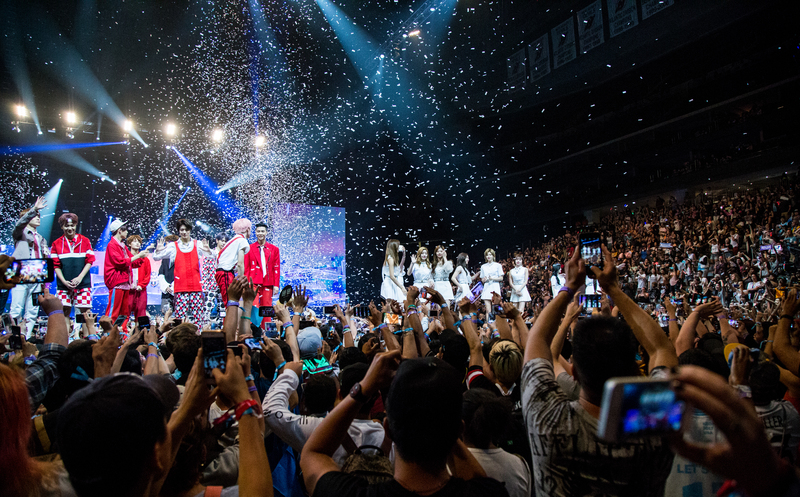 Bigger and better than ever, the convention portion of KCON 2017 NY was spread out. Which was nice on the second, breezier day, but Friday’s humidity was kind of a killer. That’s why the E-Sports Amazon tent made a lot of people happy with its air conditioning, giving people walking from one section of the con to another a break for a few minutes. There were a lot of vendors and fan-run booths, including our friends from ECKO with a mini K-pop art exhibit, but there were, sadly, less beauty booths than the previous year. There were still plenty of goodies, especially from Innisfree, which gave out free masks to people walking around with a unique voucher system. If convention goers began to feel famished, there was plenty of food to go around. 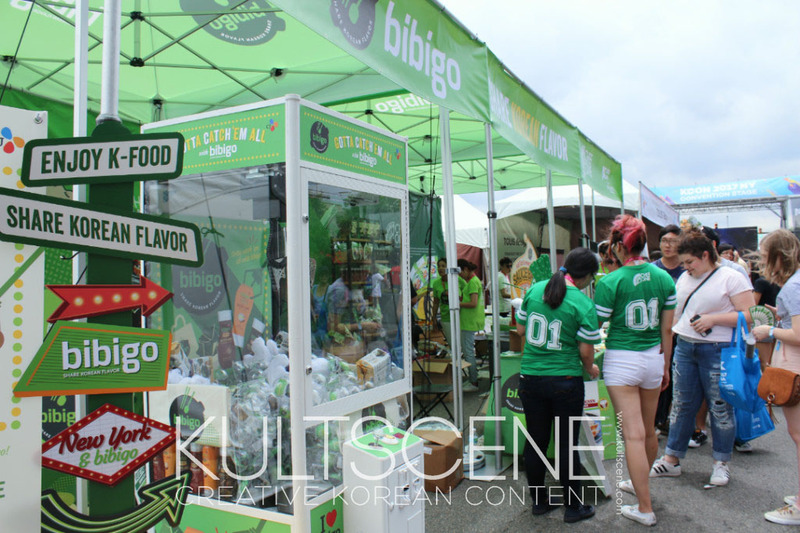 The Let’s Enjoy K-Foo Event Zone gave out free samples of snacks and drinks as well as held games and dances to win even more yummy treats. And if you were looking for something a bit more instantaneous and fulfilling, there were also many food vendors selling both the usual festival food alongside Korean food and refreshing drinks. The convention stage set outside of the Prudential Center allowed convention goers and even attendees without convention passes to watch various acts throughout the day. 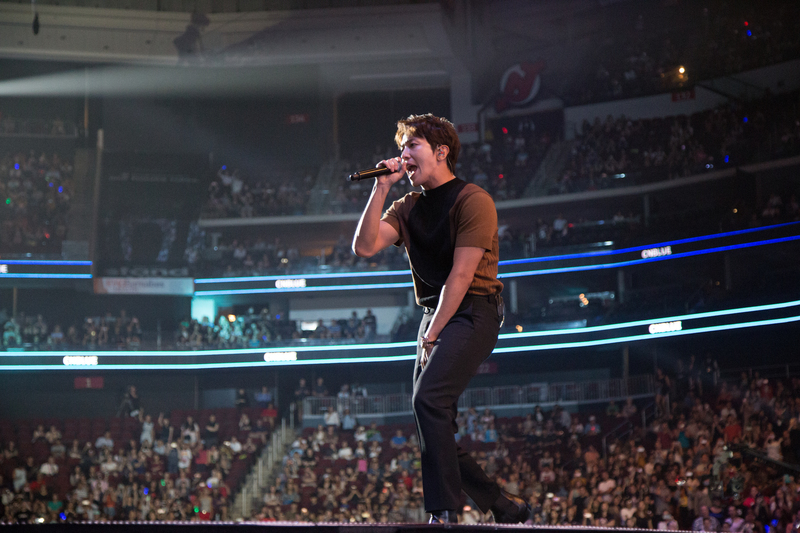 Popular musical performers like JunCurryAhn and David Kim took the stage and made the audience swoon over their incredible cover songs, while dance troops 1MILLION and Canada based East2West pumped up the audience with their high-intensity dance routines. Recently disbanded Cocoa Avenue also held their last performance, and while it was rocky, the fans responded by singing along to their cover of Beenzino’s “Boogie On and On” and other original tracks. Like last year, there was a variety of different panels that spanned from topics including fashion, dramas, and, of course, music. Fans were able to hear from figures that are prominent in their respective industries as well as other fans who are just as passionate about the topic they were speaking about. Talented writing and producing duo LDN Noise (who are responsible for hits like Shinwha’s “Sniper,” Red Velvet’s “Dumb Dumb,” and NCT 127’s “Fire Truck”) gave fan the inside look on how to produce a hit K-pop song and even broke down EXO’s song “Monster” into all of its underlying sounds and beats to see what the song was composed of. 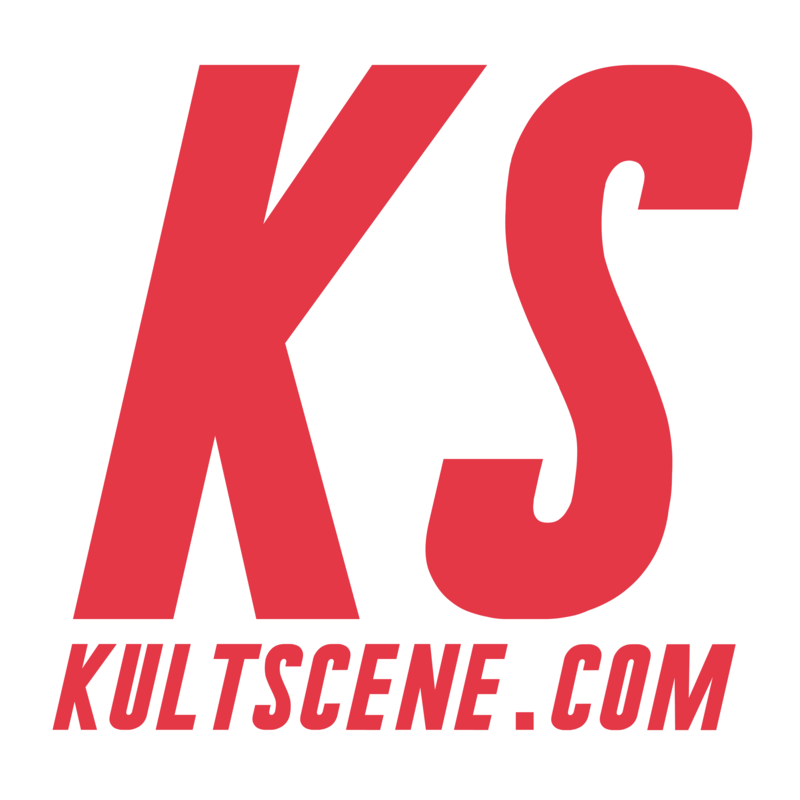 Kultscene’s very own Tamar Herman also participated in the “What Type of K-Pop Fan are You” to talk about the different types of fans there are along with popular YouTubers. 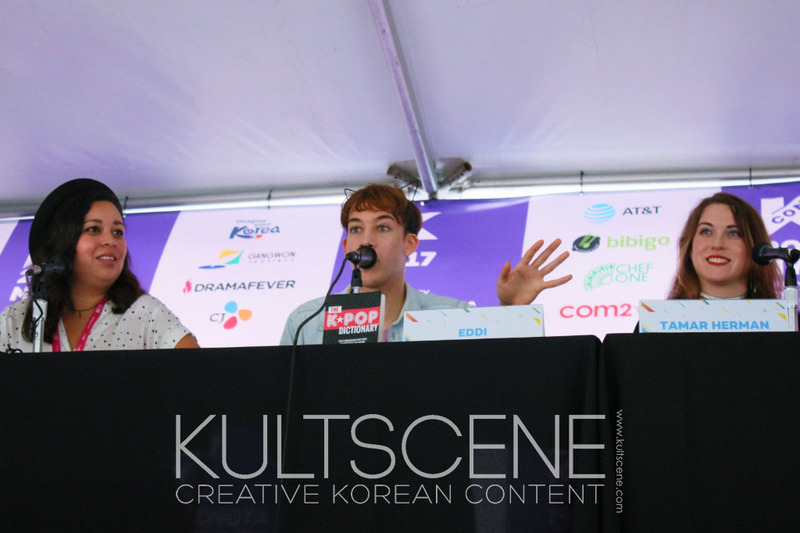 And speaking of YouTubers, this year, KCON brought out more vloggers than ever before, including those residing in Korea like Edward Avila, Joan Kim, and Whitney Bae. 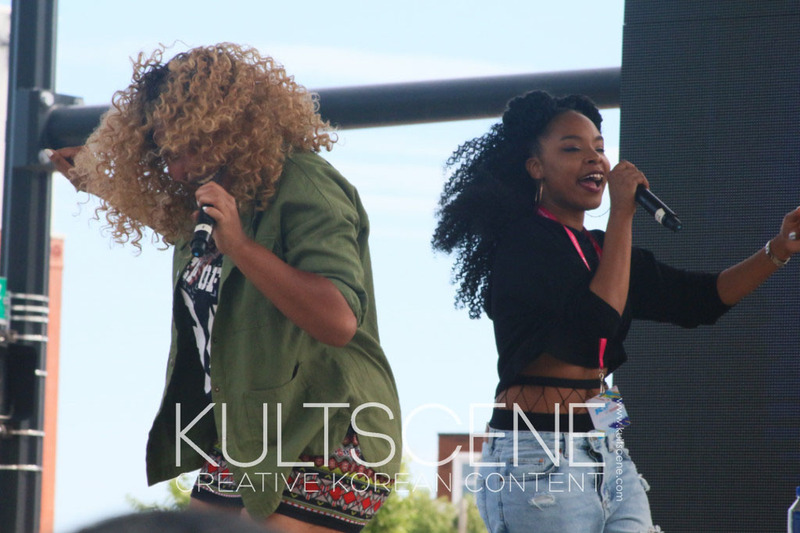 There were also KCON regulars like JRE and Courtney and Jasmine from 2minjinkjongkey. The workshops this year hosted the usual beauty gurus and how-to cooking lessons but to change things up a bit they added a Paint Nite: KCON Style where people can bring out their inner Da Vinci was added. One of the more popular workshops was the Dance Workshop Stage. 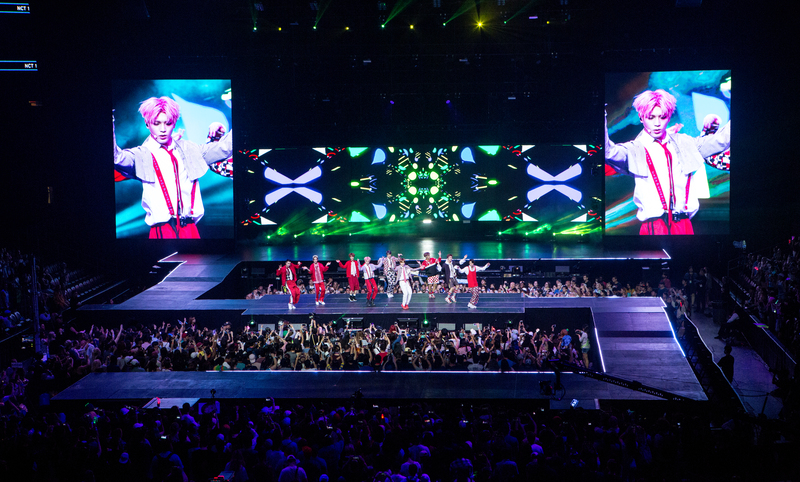 There, different choreographers gave step by step lessons to a variety of dance styles and choreographies. Also, popular dance studio 1MILLION held an intense dance battle against main choreographer Lia Kim, where the winner got a chance to dance with her. To close out the convention portion of the event, the red carpet is the transition into the show for a few lucky fans who won the scratch off vouchers. This year, every act walked the carpet to greet fans, hold a quick Q&A, and talk about their outfit choices. Or at least that of their stylists. On the first day, the first to walk the red carpet was rookie group KNK, decked in white suits that accentuated their chic features and height. To poke fun at the situation, the guys struck some exaggerated poses for photographers and fans. They said they really wanted to come to KCON 2017 NY and that this was their first time in the city. (Despite being in Newark). 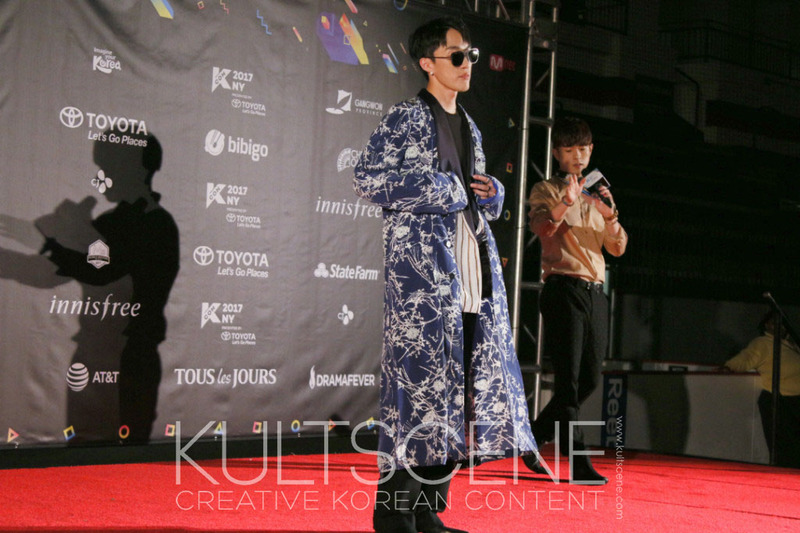 Next up was R&B crooner Zion.T, whose red carpet stint was swift but memorable, and the fans went nuts cheering for him, making him break his composed demeanor and crack some smiles. The only girl group of the night, GFriend, walked next, wearing all black ensembles. Despite missing member Yerin, the rest of the girls were all smiles while at the red carpet. 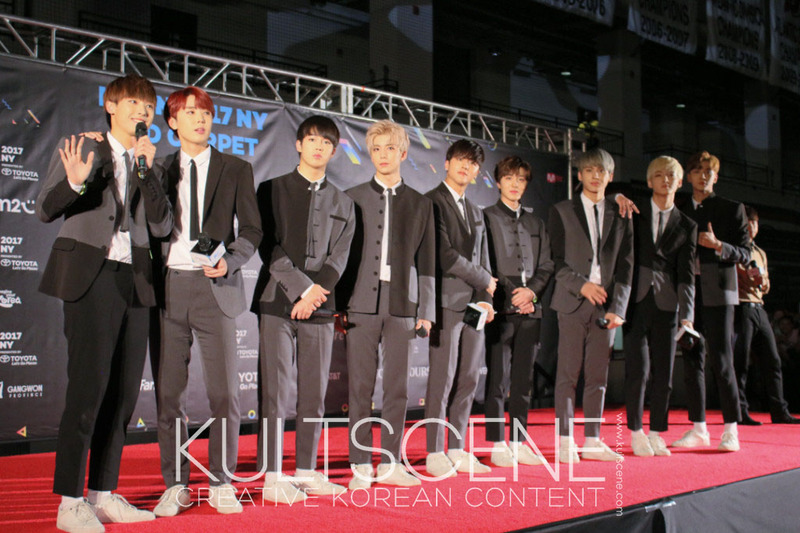 While it was SF9’s first time at KCON, the members expressed their nervousness yet excitement to be there. Donning school uniforms à la Produce 101 Season 2 with lime green lining, one of the members said: “It’s been five years since I graduated from high school, but it still feels good,” inciting giggles from the audience. 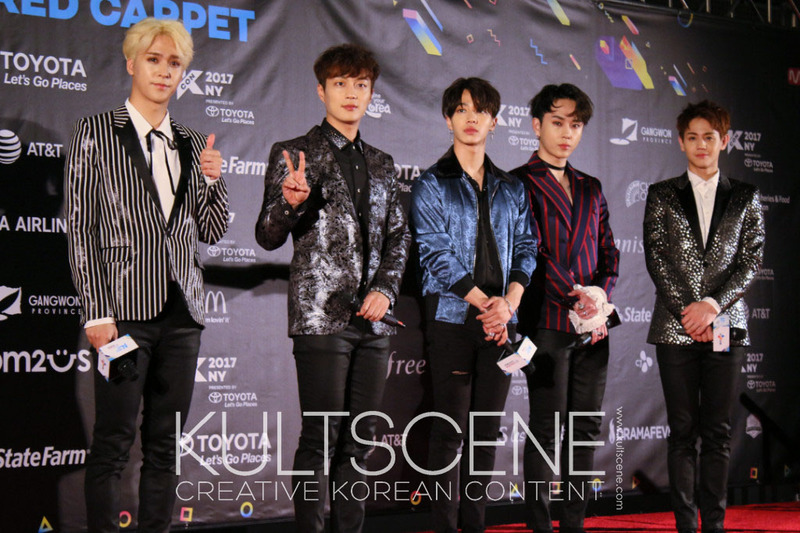 The clear highlight of the red carpet was, of course, Highlight, who bickered on the red carpet over who was the most fashionable. At the end, however, they unanimously picked Junhyung, who was wearing a striped blazer and choker. All five members, however, sported shiny, dapper outfits that showcased their personalities. The next day, the MC for the red carpet was none other than U-KISS’ former member Kevin Woo. He did a fantastic job filling in the downtime before the event and in between artists, something that’s always awkward for the MCs, but Kevin knew how to work the crowd well. He also shared that he’s working on a comeback and hopes to come back to the States as a soloist. Being an idol himself, the audience shouted for him to twerk and even pressured him into singing and dancing “Signal,” after he declared himself a Twice fan boy and a Momo stan. “They’re all cute and adorable,” he clarified. This, and starting a fan chant, was the perfect transition to the first group, Twice. Known for their typical athleisure outfits, the girls wore ladylike outfits accessorized with shiny earrings. Asked the same fashion questions as the day before, Jihyo said all the members were fashionistas because everyone had different styles. After Twice, the mood changed a bit in the audience since most fanboys dipped once the group left. 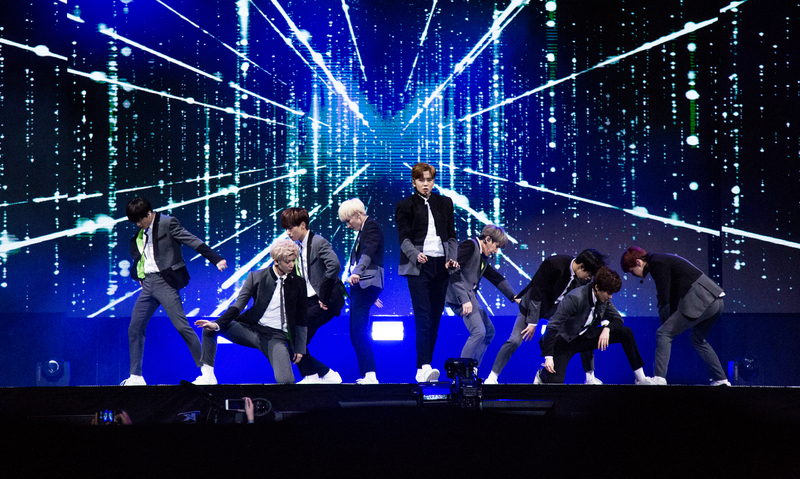 Now, it was up to the fan girls, who screamed their lungs out once UP10TION emerged. The nine members came out wearing colorful yet casual outfits, all different from one another but cohesive. The guys were excited to see their fans and even asked the crowd to watch their music videos a lot before going backstage. But no screams were louder than when rookie group NCT 127 came out. It was so loud that you couldn’t hear what the members or Kevin said. Other than their bright red outfits, the guys sported poker faces throughout the entire event and weren’t as lively as other groups. 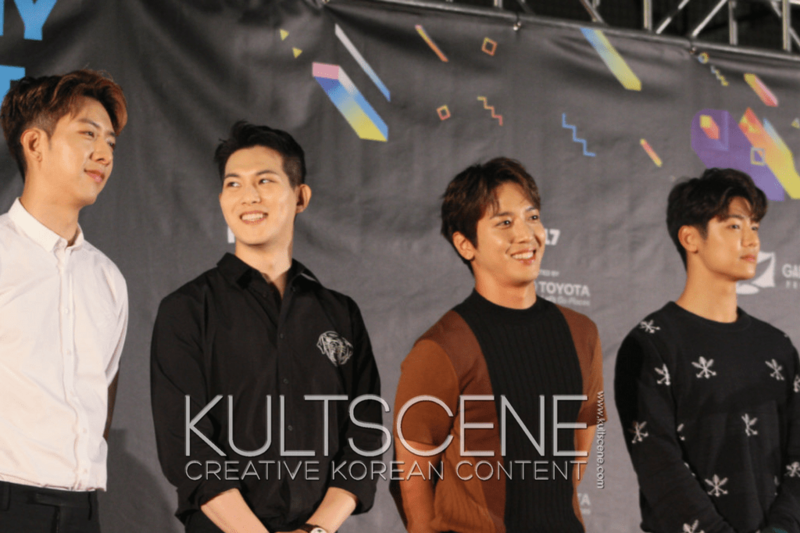 To end the red carpet portion of KCON 2017 NY, day two’s headliners CNBLUE shut the whole thing down with their charisma and style. In their case, bassist Jungshin was selected as the group’s fashionista, though said they were all fashionable. 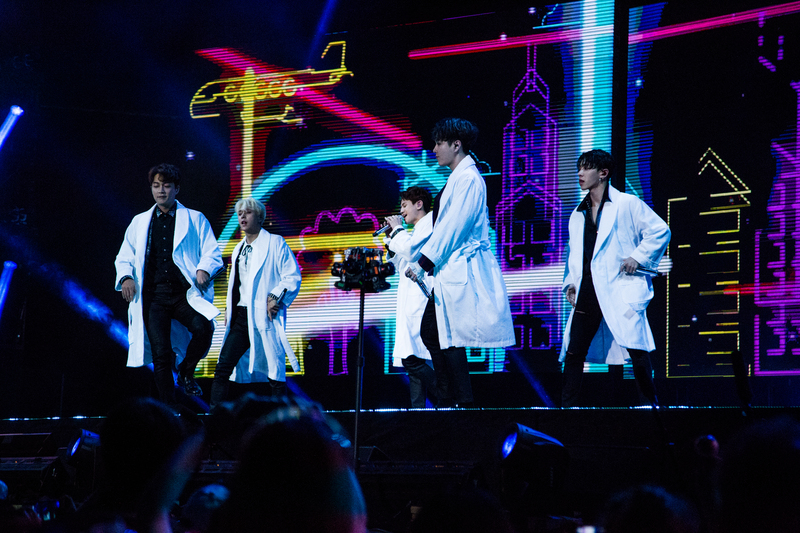 Jonghwa, being the resident English speaker, told fans they were all gorgeous with a huge smile, which melted more than a couple of hearts in the audience. 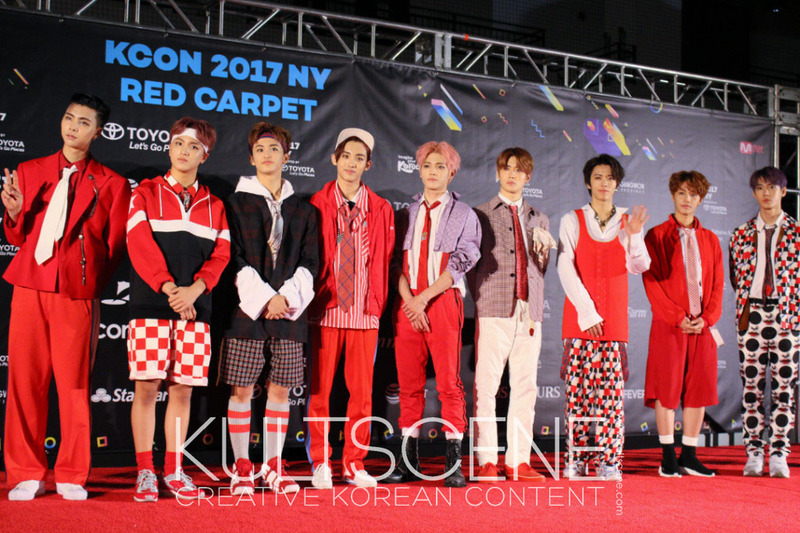 Did you attend KCON 2017 NY? What was your favorite thing about it? Let us know in the comment section below and be sure to subscribe to the site and follow us on Facebook, Twitter, Instagram, and Tumblr to keep up with all of our posts. Alexis Hodoyan-Gastelum, Tamar Herman, and Katherine Villalon contributed to the writing of this article.